How Accessible Is Our Science? | Science, I Choose You! How Accessible Is Our Science? September 28 and 29 were two very busy days for me. One reason being that I managed to complete a 9K obstacle charity run called the Concrete Hero Challenge (trust me, falling into water from the monkey bars on a rainy Vancouver day was NOT FUN). The other being that my department’s outreach program participated in the 2nd Annual Community Science Celebration at the Vancouver Telus World of Science. What’s so special about the community science celebration? The biggest draw – free admission. Over the weekend, more than 20,000 people visited the Science World, many were parents with their kids. I, together with my supervisors and volunteers, were all extremely impressed by the enthusiasm Vancouver has for science. I admit that every time I help organize a public science event, the biggest fear has been that nobody would show up, but the fear has always been proven unnecessary – it feels like Vancouver is the place to be for science. Now, this is supposed to make be really happy, and it did for a few days – until I realized how much the admission rates for the Science World are. This means that for a non-member family of four, it costs $75.50 to visit the Science World once (1 year membership for a family is $185 – still pretty pricey). If we include the cost of of transportation (public transit or parking/gasoline) and eating out, it can cost more than $100 for a family to visit the Science World once. 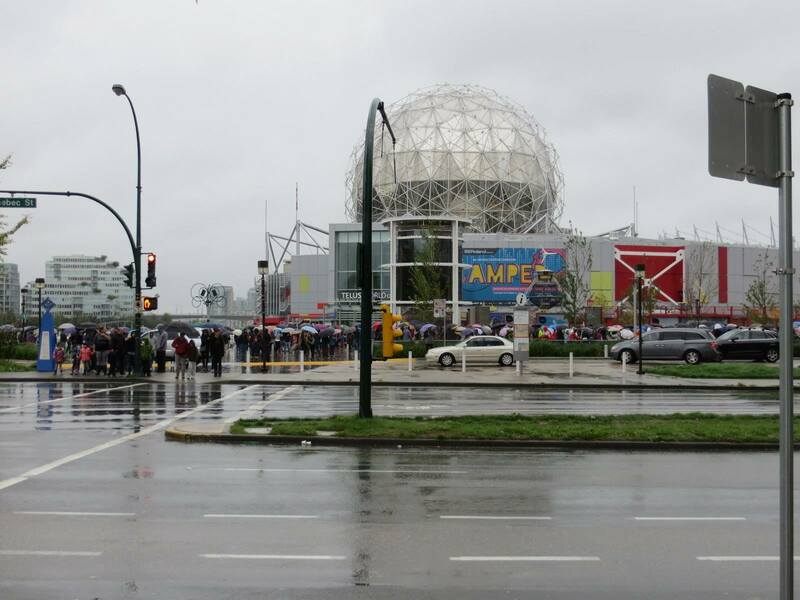 No wonder people were lining up around the block to get into the Science World on a free-admission day*. @TheresaLiao Yeah. Cal Academy of Sciences is $20 for a kid <12/yo, $25 for a kid 12-17, and $30 for adults. Enough to even deter me! Perhaps simply my speculation, but I wonder what this says about how accessible science is to a population, and whether that affects people’s perception of science? Can low-income families access science materials online, considering a family’s access to internet is related to its household income? How accessible is our science? Are there things we can do to make science truly accessible regardless of background or income? Is science literacy really just about better science education and communication? * By no means am I considering this the fault of science centres. Truth is that running a science centre costs money – it is incredibly awesome that Vancouver Science World has this community celebration day for everyone to visit! My concern is more on the price tag of accessing science, and whether we (as a whole) can be doing more to support places such as the Science World. It isn’t quiet fair to compare to the Taiwanese price directly, since you should renormalize based on GDP per capita in terms of PPP. $4 to a person in Taiwan should feel like about $12 to a person in Canada, according to that conversion. However, European centres being free is sufficient to make your point, so I am just being pedantic. However, I would rather fund research, education, and internet-based outreach over science centres (of course, in an ideal world you would fund everything!). At least in my life, science centres did not have any effect on my interest in or knowledge of science (and I’ve visited some as a kid). I agree that funding research and education is important (especially basic science education). My point is that we should not only be advancing science, but also enable the general public to be science-aware, especially considering many significant decisions we are making are relevant to science nowadays. Internet access is still tied to income (there is a link in my post about this), and by focusing more on the internet we are not reaching the population with no time or money to access internet at leisure. And sometimes we think of a free event as a free event, but for a say, low-income family, there are many other things to consider – How much does it cost to get there? How much does it cost to eat out? Things are we don’t usually need to worry about, added on top of the events that we considered “free.” And when science becomes unreachable, it is not a surprise that scientists do not get the support they should when it comes to issues about funding or decisions relevant to science (medicine, environment, energy consumption, etc). I actually thought about the GDP point when I was writing the post. One reason for not including it was that it indeeed wasn’t a fair comparison. Using your number of $12 for the admission rate, one can access the Tainwese centre…the place is HUGE, probably 3-4 times (or more) the size of the Vancouver Science World. It covers everything from western science to Asian wisdoms. So indeed it was not a fair comparison, and it was not meant to be one. To follow this up a little, the article you linked to about internet access also discusses internet skill and how that’s tied to income. It’s easy for us in science to assume that finding, say, a good explanation of evolution for an eight-year-old isn’t that hard. But if you’re not connected to the scientific community, and your own understanding of science and the internet isn’t good, this becomes a monumental challenge. Hand-on science education in general is in something of a decline; educators at all levels are facing budget cuts and opting to replace more expensive lab equipment with cheaper computer programs. There are definitely some benefits to computer simulation as a learning tool, but it is leaving a gap that a number of educators I’ve talked to are concerned about. We need to give people some appreciation of interacting with the real, physical world in all its complications. All that to say, I’m in favour of more government funding for places like Science World, even if that has to come from somewhere else.